Washington has succeeded in using transparent lies to demonize Russia as a dangerous aggressive country led by a new Hitler or a new Stalin, just as Washington succeeded in demonizing Saddam Hussein in Iraq, the Taliban in Afghanistan, Gaddafi in Libya, Assad in Syria, Chavez in Venezuela, and, of course, Iran. The real demons–Clinton, Bush, Obama–are “the exceptional and indispensable people” above the reach of demonization. Their horrific real crimes go unnoticed, while fictitious crimes are attributed to the unexceptional and dispensable people and countries. Washington’s incessant lies alleging “Russian aggression” have created Russian aggression out of thin air. John Kerry and the State Department’s Marie Harf issue new lies daily, but never any supporting evidence. With the stage set, the US Senate, the NATO commander and the Chairman of the US Joint Chiefs of Staff are busy at work energizing the wheels of war. Senate bill 2277 provides for beefing up forces on Russia’s borders and for elevating Ukraine’s status to “ally of the US” so that US troops can assist the war against “terrorists” in Ukraine. Chairman of the US Joint Chiefs of Staff, General Martin Dempsey, is at work preparing American opinion for the upcoming war. On July 24 Dempsey told the Aspen Security Forum, a high level group where US opinion is formed, that Putin’s aggression in Ukraine is comparable to Stalin’s invasion of Poland in 1939 and that the Russian threat was not limited to Ukraine or Eastern Europe but was global. The intellects in the Aspen Forum did not break out laughing when Dempsey told them that Russia’s (alleged but unproven) involvement in Ukraine was the first time since 1939 that a country made a conscious decision to use its military force inside another sovereign nation to achieve its objectives. No one asked Dempsey what Washington has been doing during the last three presidential regimes: Clinton in Serbia, Bush and Obama in Afghanistan, Iraq, Somalia, Pakistan, and Yemen, Obama in Libya and Syria. Washington’s view that the world is its oyster is so ingrained that neither Dempsey nor his upper echelon audience at the Aspen Forum noticed the absurdity of his statement. Washington and the brainwashed US population take if for granted that the “exceptional, indispensable nation” is not limited in its actions by the sovereignty of other countries. Washington takes for granted that US law prevails in other countries over the countries’ own laws–just ask France or Switzerland, that Washington can tell foreign financial institutions and corporations with whom they can do business and with whom they cannot–just ask every country and company prevented from doing business with Iran, that Washington can invade any country whose leader Washington can demonize and overthrow–just ask Iraq, Honduras, Libya, Serbia, and so forth, and that Washington can conduct military operations against peoples in foreign countries, such as Pakistan and Yemen, with which Washington is not at war. All of this is possible, because Washington has claimed the title from Israel of being “God’s Chosen People.” Of course, Israel’s loss of the title has not stopped Israel from acting the same way. Washington now has in motion the wheels of war. Once the wheels of war begin to turn, momentum carries them forward. The foolish, indeed utterly stupid, governments and media in Europe seem unaware of Washington’s orchestration of their future or lack thereof, or they are indifferent to it. They are dooming themselves and all of humanity by their insouciance. Heaven help if the British PM or French president or German chancellor were not invited to the White House or the Polish nonentity did not get his Washington stipend. The only possibility of avoiding war is that Putin take his case to the UN. If Washington can send Colin Powell to the UN unarmed with any truth to make Washington’s case for war against Iraq, Putin should be able to take his case to the UN against Washington’s war against Russia. The case that the emperor has no clothes is an easy one to make. Unlike Washington, Putin is willing to share the evidence that Russia has about who is doing what in Ukraine. It is a simple matter to establish that Washington organized a coup that overthrew an elected government, supports violence against those who object to the coup, and has turned a deaf ear to Russia’s repeated pleas for Kiev and the separatists to negotiate their differences. Putin should make it clear to the world that Washington continues with provocative military steps against Russia, with force buildups on Russia’s borders and calls for more buildups, with S.2277 which reads like a US preparation for war, with provocative actions and accusations by top US generals and government officials against Russia, and with efforts to isolate Russia and to inflict economic and political injury on Russia. Putin should make it clear to the world that there is a limit to the provocations that Russia can accept and that Russia believes that Russia is in danger of preemptive nuclear attack by Washington. Putin can describe Washington’s withdrawal from the ABM treaty, the construction of ABM bases on Russia’s borders, and the announced change in Washington’s war doctrine that elevates US nuclear forces from a retaliatory role to a preemptive first strike role. These actions are clearly directed at Russia (and China–wake up China! You are next!). Putin must state clearly that the likely consequence of the world continuing to enable Washington’s lies and aggression will be not merely another disastrous war but the termination of life. The governments of the world, especially Washington’s vassals in Europe, Canada, Australia, and Japan, need to be told that it is their responsibility to stop their enabling of Washington’s aggression or to accept their responsibility for World War III. At least we could all have the enjoyment of watching the arrogant Samantha Powers and the craven British lapdog rise and walk out of the UN proceedings. There is no doubt whatsoever that Washington is unable to answer the charges. A hostile power is defined as any country that is not a Washington vassal. 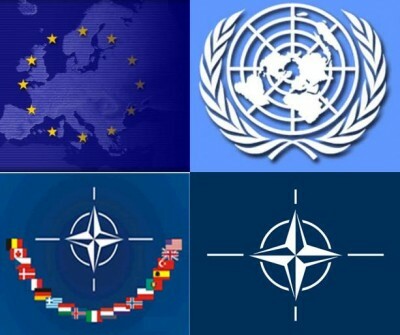 The Wolfowitz Doctrine commits the United States, its peoples, Washington’s gullible EU allies and those peoples to war with Russia and China. Unless Russia and China surrender, the world will be destroyed. The destruction of the world is what the idiot EU governments and the presstitute Western media are fostering by their enablement of Washington’s lies and aggression.